When Is Rocephin Shot Needed? How to Use Rocephin Shot? What Are the Possible Side Effects of Rocephin Shot? Rocephin is an antibiotic available for both intramuscular and intravenous administration. This sterile, broad-spectrum, semi-synthetic cephalosporin antibiotic works by killing bacteria in your body. When you decide to take a Rocephin shot, it is important to first learn everything about it. Keep reading to learn more about how to take a Rocephin injection, when to avoid it, Rocephin side effects and so on. Your doctor may prescribe a Rocephin injection to treat a variety of bacterial infections, such as pelvic inflammatory disease, gonorrhea, meningitis, and infections of the ears, lungs, urinary tract, skin, bones, blood, joints and abdomen. You may even get a Rocephin injection before certain types of surgery to ensure you don't develop an infection after the procedure. 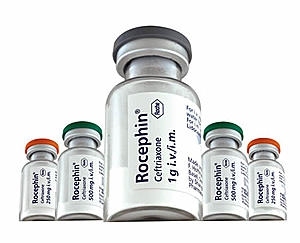 Rocephin belongs to the class of medications known as cephalosporin antibiotics, so it is not effective against fly, colds, or other viral infections. The injection is available in a liquid form that can be injected both intramuscularly or intravenously. Your doctor will consider your condition and may choose to give you a single dose a day – they may even give a Rocephin shot twice a day for 4-14 days. It is possible to administer the injection at home, but it is better to visit a doctor's office to avoid any complications. Be sure to take it at the same time every day if you're using it at home. Always pay close attention to any directions on your prescription label and never exceed the recommended dose. You will experience some relief from your symptoms after a few days of taking a Rocephin shot. You should, however, get in touch with your doctor if your symptoms don't improve or you experience any Rocephin side effects. If you feel better after a few shots, it is important to use it until you finish the prescription. Never skip doses or stop too early because you feel better. This may make the bacteria resistant to Rocephin. Just like other antibiotics, there are certain side effects associated with the use of Rocephin. You may develop an allergy after taking a Rocephin shot. You should contact your doctor immediately if you notice any signs of an allergic reaction, such as swelling on your lips, face, or throat; difficulty breathing and hives. Be sure to seek immediate medical attention if you notice any of the abovementioned serious side effects of using Rocephin. You should avoid using Rocephin if you have allergy to Rocephin or other similar antibiotics, such as Raniclor, Ancef, Duricef, Omnicef, Vantin, Spectracef, Cefzil, Keflex, Ceftin, Cedax or Velosef. It is equally important to understand that the use of Rocephin may lead to serious side effects if you have an existing medical condition. Be sure to inform your doctor about any of the following conditions before you start using Rocephin. Also, tell your doctor if you're malnourished or have an allergy to penicillin before using Rocephin. Moreover, the antibiotic is not supposed to cause any harm to an unborn baby, but it is still important to tell your doctor if you're pregnant. You should, however, avoid using the medication if you're nursing a baby because Rocephin can pass into your breast milk and may harm your baby. Avoid using it in children.